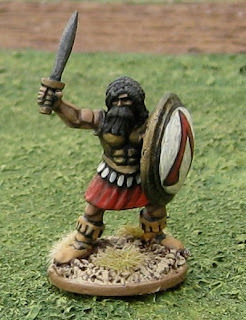 My friend John has been modeling stuff in 40mm lately. First for his Great (imaginary) European War of 1850, and more recently for the 1914 battles of the Great War. 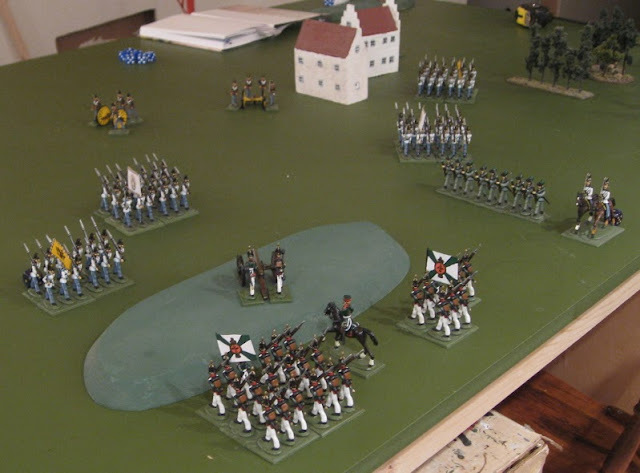 When I was over there last game, I brought home some of the 1914 French to try painting for him. 1914 French in 40mm sculpted and cast by my John Bertolini. 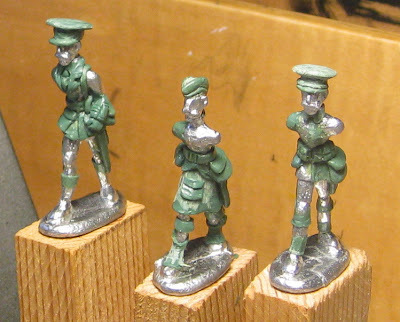 They aren’t properly based yet as we haven’t figured out a basing system for the 1914 stuff. It’ll probably be six bases of three – as with the 1850 stuff. John’s also done 1914 Germans and Russians and probably Austrians and other Balkan armies…. But not the British…? That’s okay, because I’m working on my own (though I haven’t made any more progress since the last post). 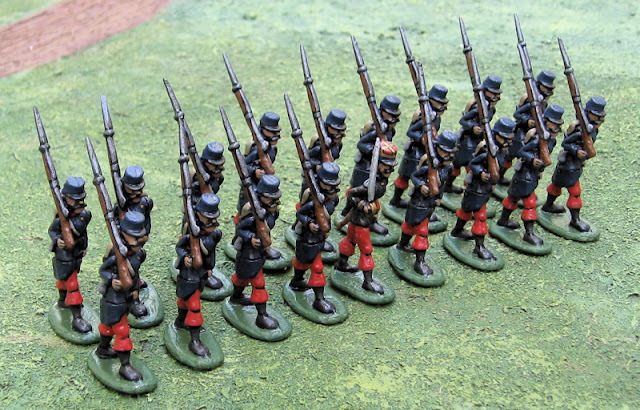 Maybe I’ll try and get that last unit of my own 28mm 1914 French done…? Or get cracking on my 40mm 1914 British! 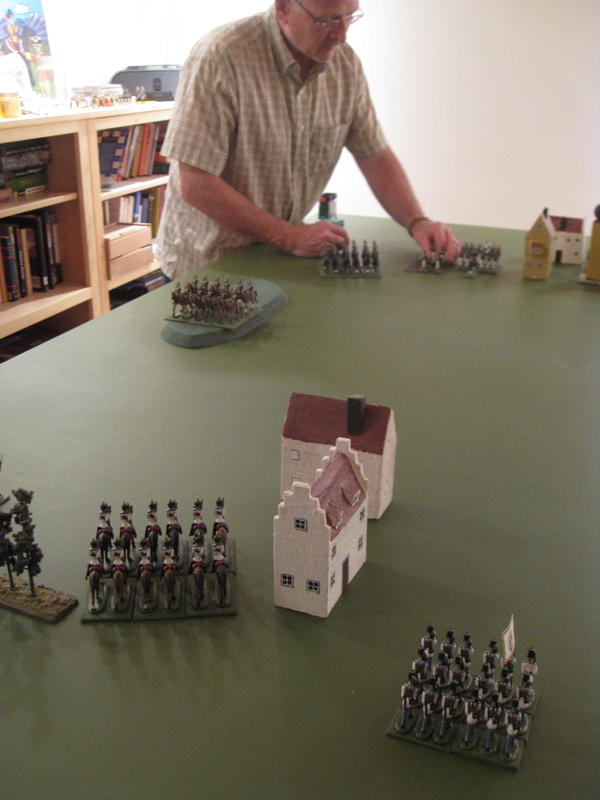 I got out to play Wargaming Nineteenth Century Europe 1815-1878 with John again. 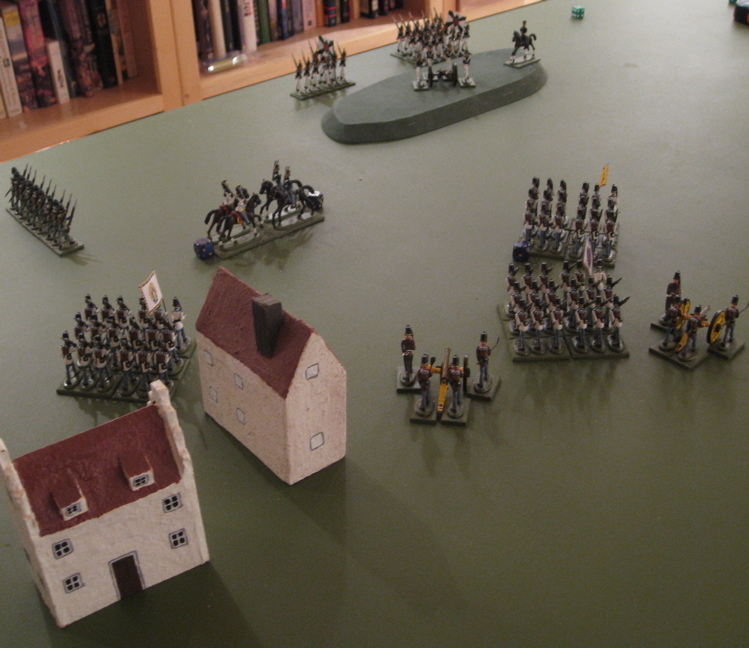 We played another scenario set during an imaginary war in Europe circa 1850 – following on from our previous game. This time we actually played one of the scenarios out of the book. We decided on a meeting engagement and then rolled on the appropriate tables to determine forces and table edges and whatnot. After executing a brilliant fighting retreat, the Austrian commander, Gen. Felix von Breunner, has regrouped his men, received reinforcements and been resupplied and is now ready to meet the Russian forces under General Yuri Yaroslavich Bertolovski. Shortly after the general advance had been ordered, a message arrived at the General HQ that a force of Russians has been spotted advancing on the right flank! Von Breunner ordered forces diverted to meet the Russian advance. As I mentioned we chose to play the meeting engagement. 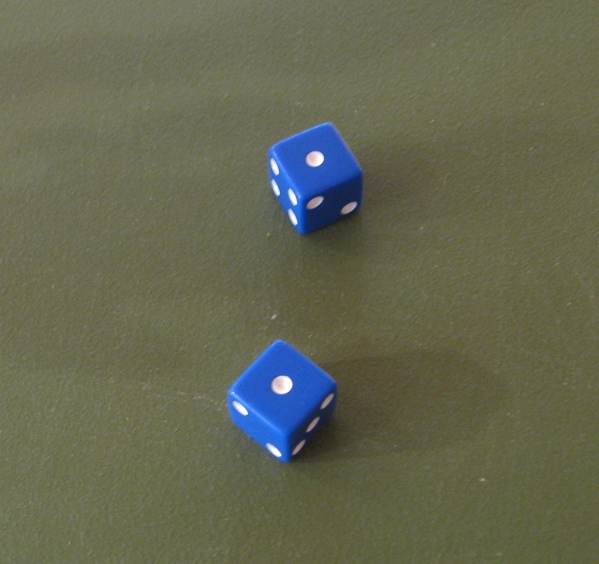 With most scenarios the meeting engagement is meant to be played on a `4’x3’ table using centimetres, we played on a 4’x8’ table using inches. There were three objectives placed about the table. At the end of turn 15 whoever held at least two of them would be the winner. We dice for force make-up, who would be attacker and defender and which side of the table the defender would set up on (the attacker would set up opposite). Each side is to start with three units on the table, the remaining units were to be organized into columns of two units. Then each commander had to determine what order he wanted each of these columns to arrive in. arrival of columns would be diced for at the beginning of each movement phase. We diced for the forces we would get (see above). Then we diced for who was “defending” – that was me – in this case it just meant John went first. Then I diced to see which end of the table I was defending – it turned out I was defending the east end – one of the short ends of the table. 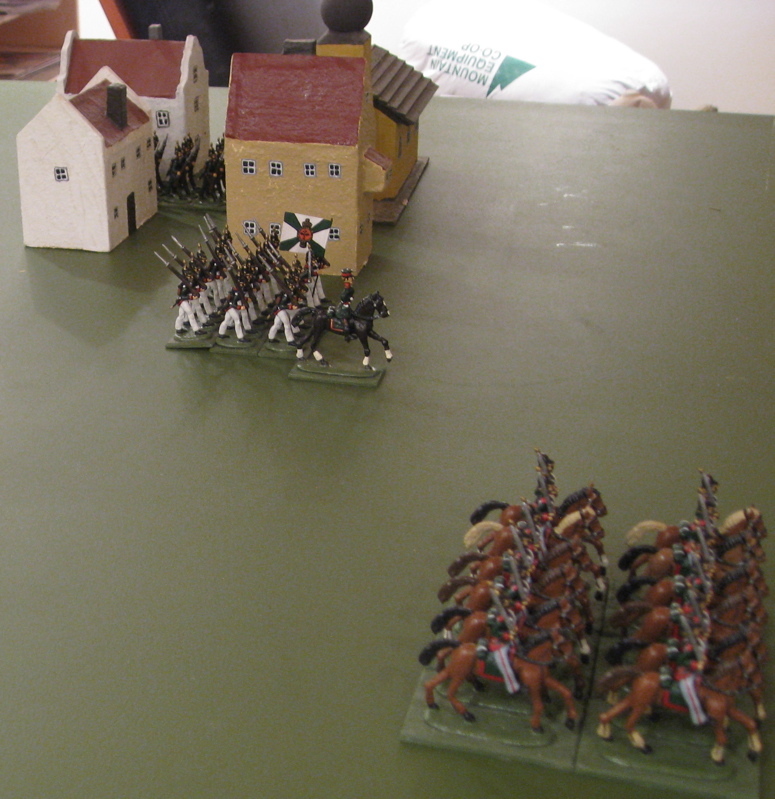 I was to set up three of my units within 15” of the east end (one infantry, one skirmish, and one cavalry). John would do the same, except the Russians apparently don’t get skirmish units… So I think he set up an additional regular infantry unit. The starting Austian forces. 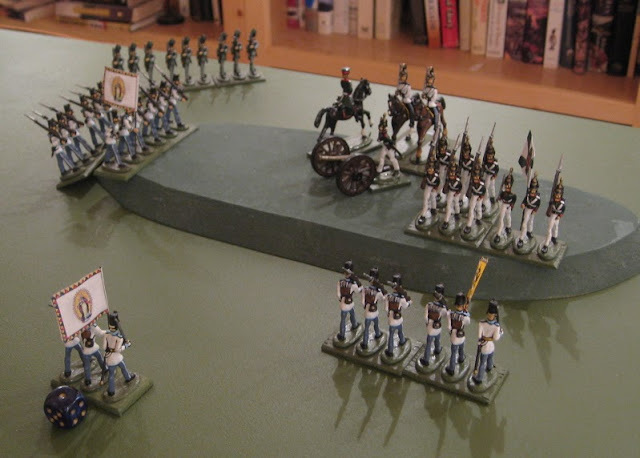 Infantry, Cavalry, and Jäger/Light Infantry (skirmishers). The Russian Forces at the end of their first move – one infantry unit already in possession of the town (one of the objectives). John moving his Rusians. This is probably turn two or three. Russian cavalry is already in possession of the hill (one of the other objectives). The third objective is the village in the foreground. One of my Austiran infantry units is beside it. I originally planned to pass it by and deploy in line before it in the fields between the two towns, or veer towards the hill with the infantry as it seemed it would be the most contested objective. Unfortunately I didn’t get ANY reinforcements for the first three turns, whereas John got ALL of his reinforcements in the first three or four turns!! By the timeI was about to pass the village, there were Russian guns about to set up on the opposite end of the field which would blow away my infantry in the open, so they made a shorp turn into the village shortly after this and awaited the arrival of reinforcements. The cavalry battle! 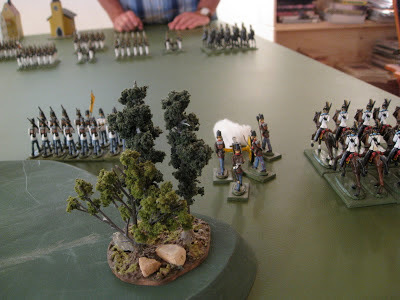 There was a great cavalry battle for the hill that went back and forth for more than a few turns as we both rushed our cavalry forward to secure that objective! This is a few turns into it as we’ve both lost a few stands! 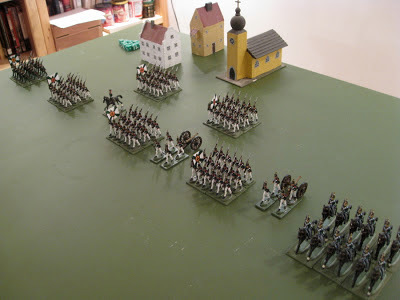 Things looking bad for the Austrian cavalry; taking serious losses and more Russians advancing quickly up to the battle!! 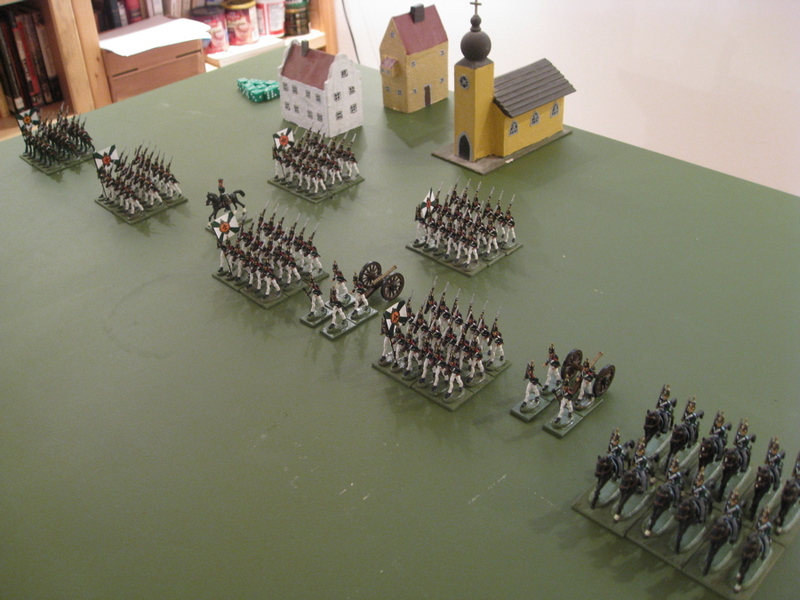 Finally Austrian reinforcements started arriving around turn four. I think I had reinforcements two turns in a row, but the rest didn’t come on for a few more turns.. The Austiran Jägers – they didn’t want to venture too far from the safety of the woods with all those Russian cavalry galloping around! 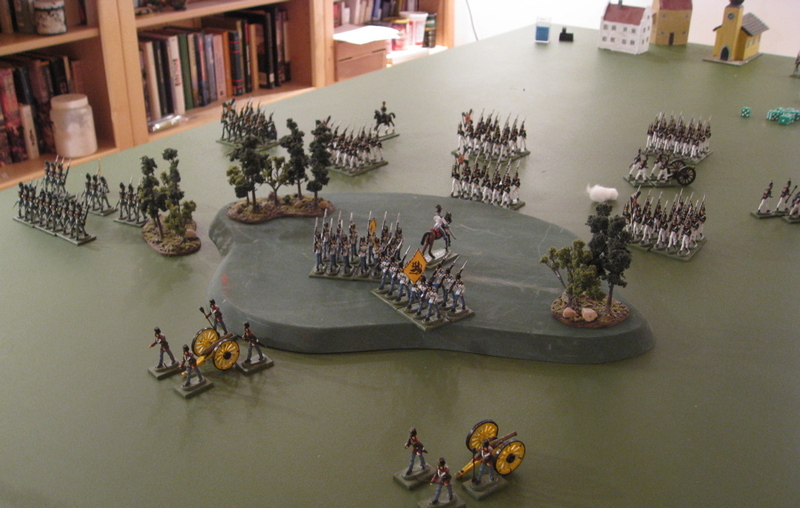 Later they would be a major pain in the side of the Russian infantry and artillery defending the hill. 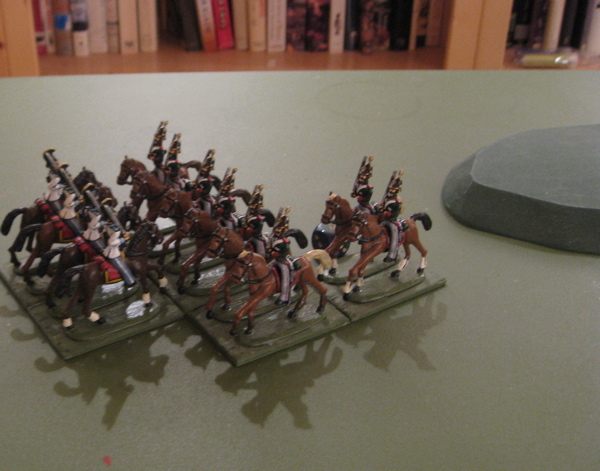 Austrian Cavalry reinforcements finally arrive! I finally got one of my guns past the village and set it up to fire into the flanks of the advancing Russians heading towards the hill. It did some serious damage to the Russian cavalry! Mental Note: keep cavalry out of the line of fire of artillery!! The Russian cavalry in the open near the top of the picture recently retreated from a battle with the Austiran cavalry and overran one of their own infantry units destroying it!! 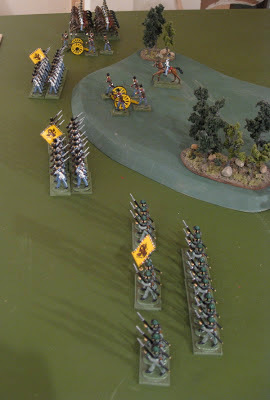 Mental Note #2: Keep infantry units out of the way of potentially retreating cavalry!! This was probably turn ten or eleven. 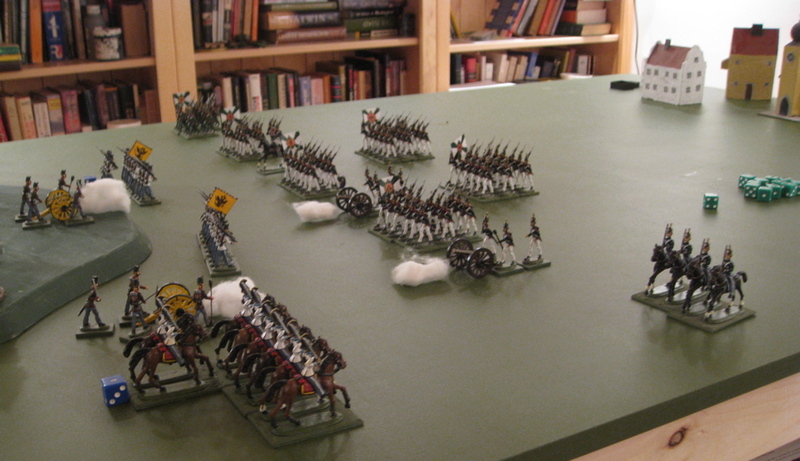 The cavalry forces have more or less shot their bolt. The Russians have infantry on the reverse slope of the hill, my infantry are still advancing towards it taking fire from two Russian artillery batteries. 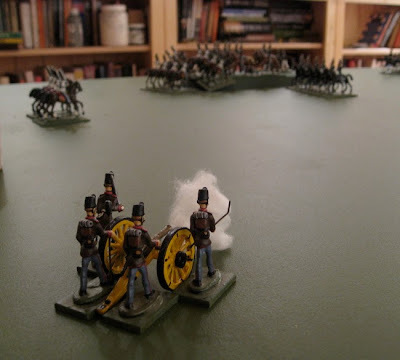 My artillery batteries had also been firing at Russian infantry and cavalry headin towards the hill, but at this point are just shooting at the Russian artillery. Four Austiran infantry battalions converging on the hill defended by two Russian infantry battalions and a gun – though there are Russian guns firing from the Austrians flank and more Russian infantry on the way as well. All the Russian Cavalry was wiped out by this point. 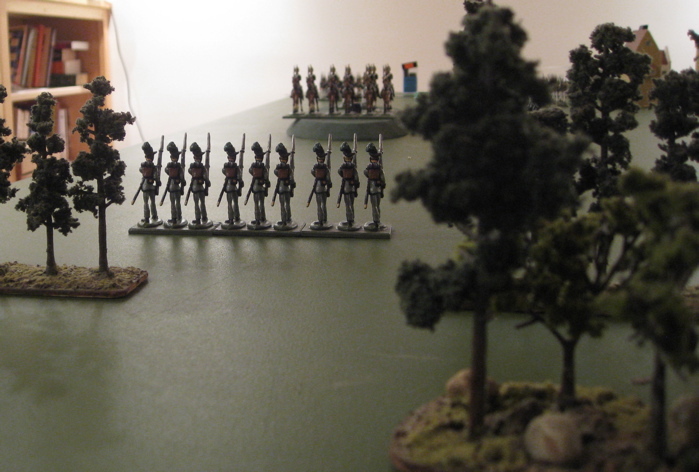 I think it was on the next turn that Russian infantry marched up onto the hill. 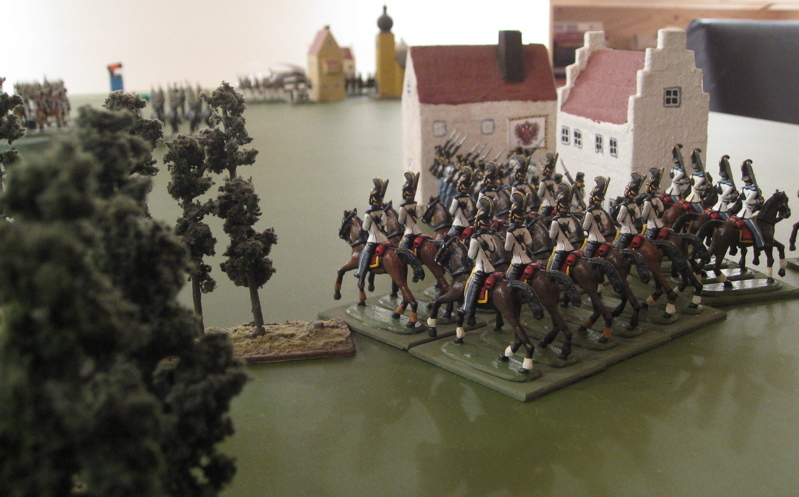 The Austrian Infantry was being mauled by the Russian guns firing canister. 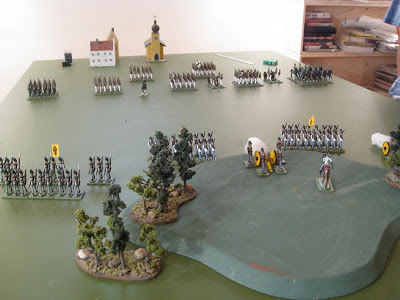 The two closest Austrian battalions had to deploy into line and try and shoot it out with the Russian infantry and guns and hope that the other two Austrian Infantry battalions advancing on the Russians flank would make it there on time! On the very last turn (Turn Fifteen!) one of the Austrian Infantry battalions charged up the hill attacking the flank of a Russian battalion that had been taking fire from the front and flank and were considerably weakened. The Austrians drove them off, taking the east end of the hill. 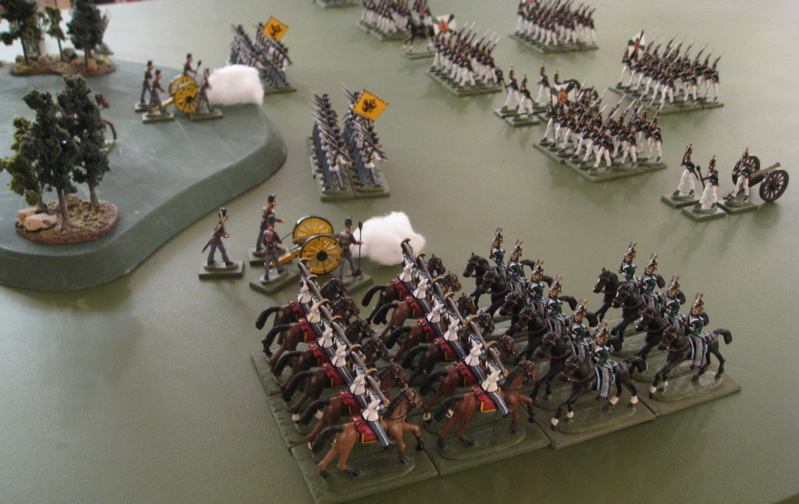 The last remaining element of Russian cavalry charged the Russian guns from the rear and wiped them out. 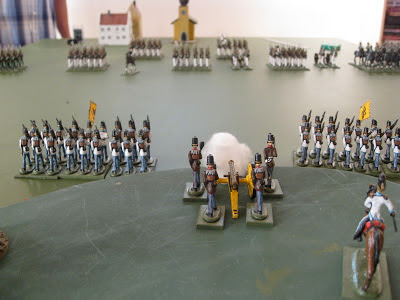 At the beginning of the battle John predicted that we would never make it to turn fifteen – that it would all be decided will before that… At Turn Fifteen it was a draw. We both held on village, but the hill was still contested. It’s hard to say which way it would have gone if we’d played on another few turns. 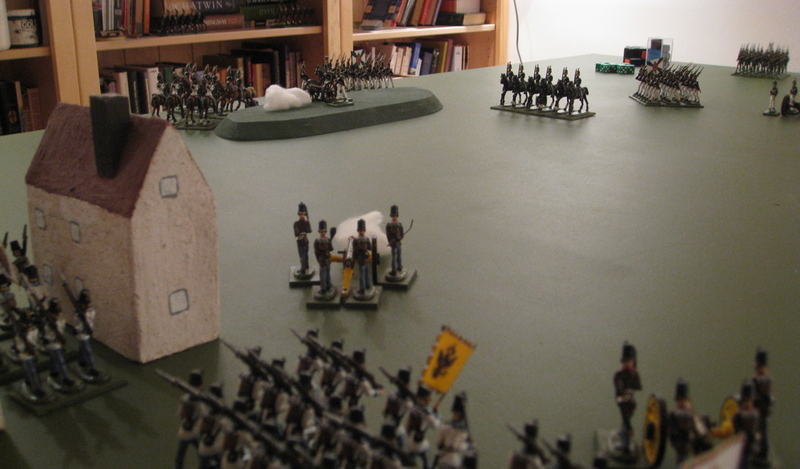 My Austrian infantry in front of the hill had been mauled and only had open or two stands left. 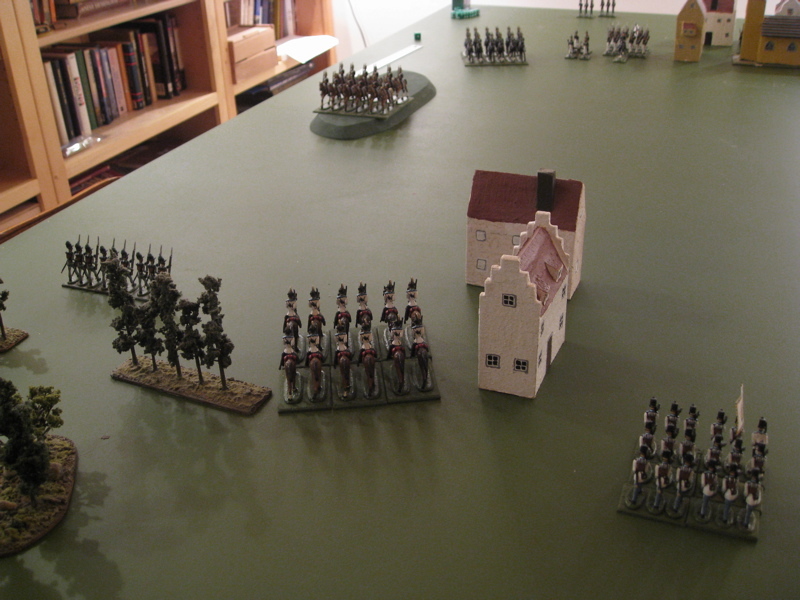 I had a full strength battalion a turn or two away from the hill and another in pretty good condition ON the hill. 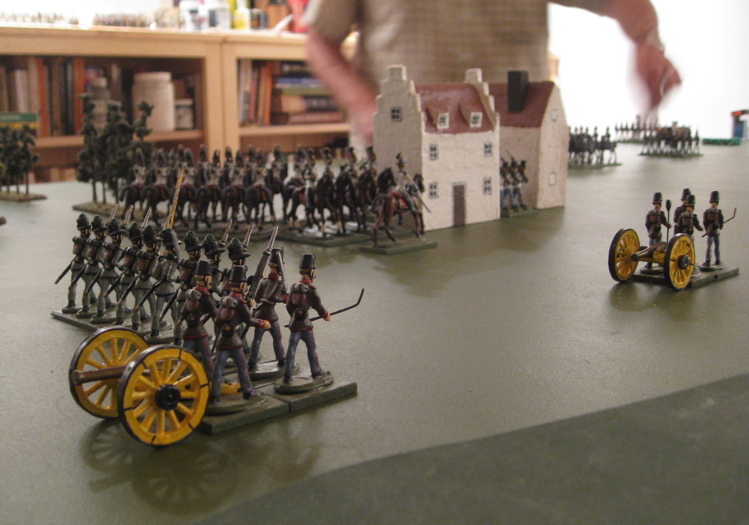 But John also had an infantry battalion still on the hill, and, I think, two more advancing towards it! I still had my two artillery batteries, john had lost one and the other had taken some hits… I just don’t know… could have gone either way. Back to the Great War stuff. Actually I’d started these guys a few weeks ago…. Then production fell off for a bit… but the other night I decided I should finish them off before entirely losing focus and starting anything else. A Second unit of regular French infantry from Great War Miniatures. STILL More Frenchmen (but in a different scale!). I have a small collection of micro scale sci-fi stuff some of it I’ve had for years – from playing Battletech in High School. Other stuff I picked up to play Adeptus Titanicus, Space Marine or Epic 40K… and later I picked up some stuff to play with Dirtside and then Future War Commander - which is what I’ll use this for should they ever get on the table. A lot of this had been repainted and rebased a number of times. Come plastic mech-like-robot. I think it might have come from EM4 Miniatures? I got it in a trade so I can't be sure. 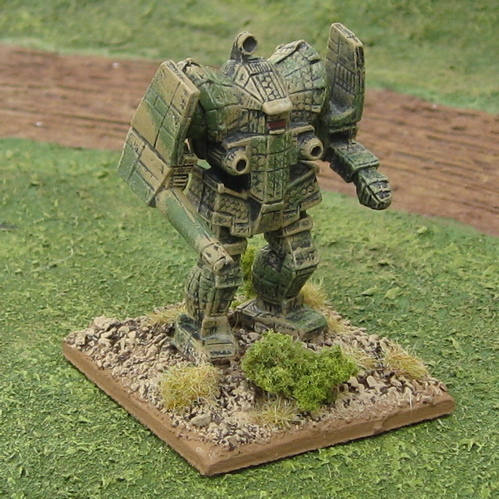 A gen-u-ine Battletech ‘Mech from Fasa. 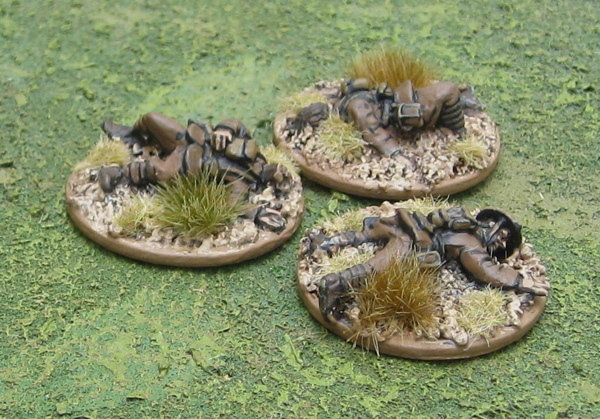 Not the most inspiring paint jobs... but there done and ready for action - should I ever get around to playing! 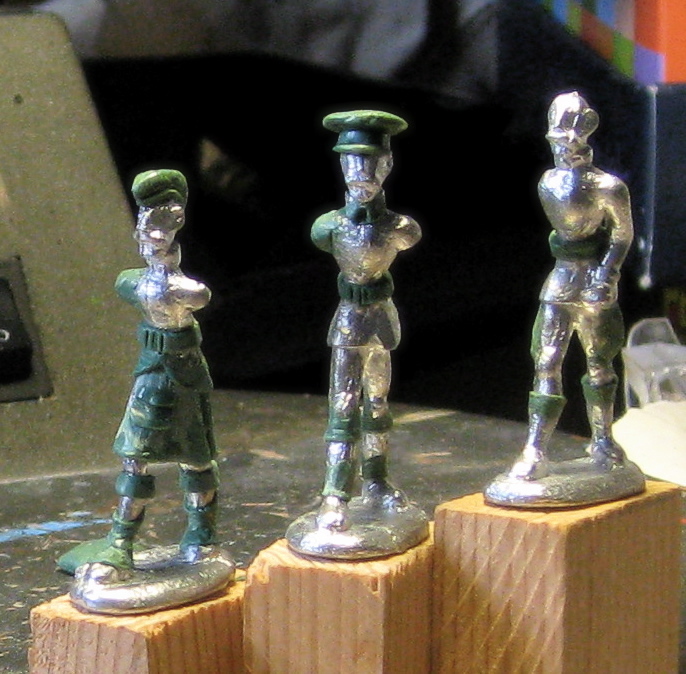 I'm working on a British Officer (left), and Highlander (centre), and a British infantryman (right). Speaking of daft ideas... Look what I started this week. Hands up! Who can guess what these are...? 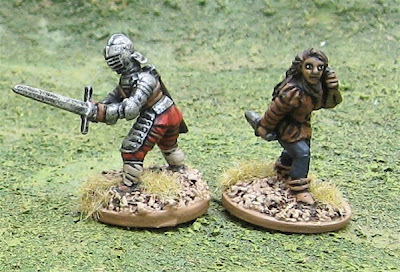 Let's make a game of it - I will send one painted sample of each (whenever I happen to finish them) to the first three that can guess the a) Scale, b) Conflict, c) Nationality, and d) What the heck am I planning on using them for!? Guessing is open until I post the next progress picture... which might be tomorrow, because I'm really kind of having fun with this! Great War British/Canadian casualties from Old Glory. 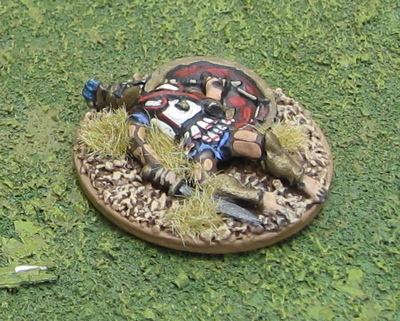 Greek Hoplite casualty from Warlord Games. Wow… production has dropped off sharply… It’s been two weeks since I’ve really painted anything. Up until June I was averaging 100 28mm foot per month… now we’re halfway through July and I’ve got less than a dozen done… Ah well.. 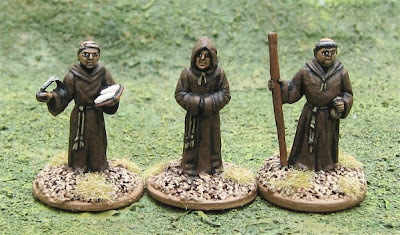 These kids are from Hasslefree Miniatures. 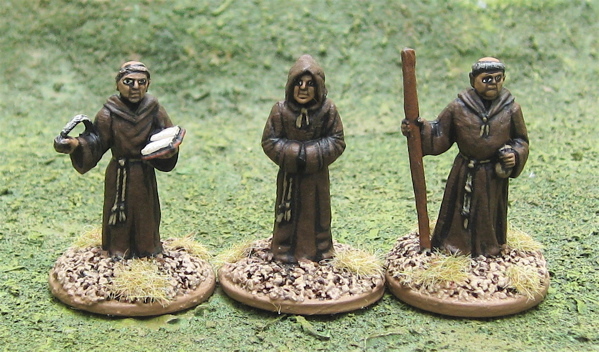 Three monks from Mega Miniatures. A really old Female Rogue type that I’ve had for over 20 years and just repainted. I have no idea who manufactured her… might have been old Citadel…? The other chap is possibly a dismounted cuirassier from Dixon Miniature’s ECW line…? I'm not sure...? Last night I wandered over to my friend John Bertolini’s to hang out and play with some of his toys – which I haven’t done in FAAAAAAAAR too long! 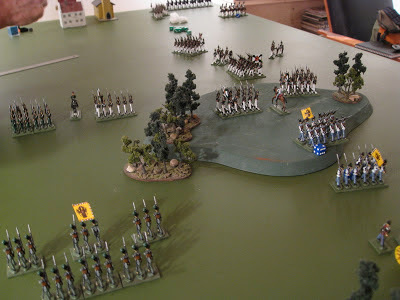 We broke out his home-cast 40mm 1850 Russians and Austrian “toy soldier” and played a game with Wargaming Nineteenth Century Europe 1815-1878 - a fun little set of fast-playing rules for… well… Wargaming Nineteenth Century Europe 1815-1878…. 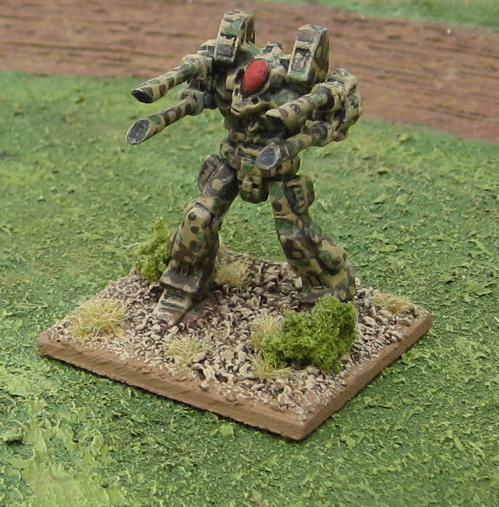 I've been in a bit of a wargaming funk the last little bit. It was nice to get out and roll some dice and play with little toy soldiers... and I didn't even have to put much thought into which ones to use or what scenario to run - because it was at John's and he'd taken care of all that! War has broken out between Russian and Austria. An Austrian regiment leading the advance has found itself themselves too far ahead of the main column and facing and entire Russian brigade with no hope of reinforcement in the immediate future and thus have to execute a fighting retreat to rejoin the main force. 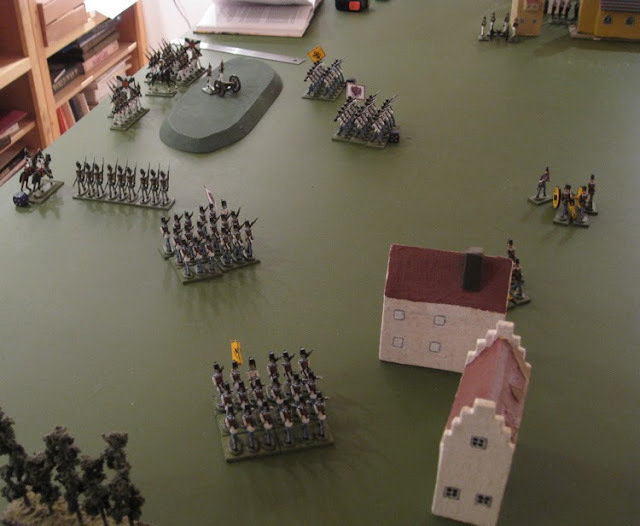 The Austrians deployed in an area in, more or less, the middle of the table. The Russians began at the “Eastern” end of the table (It was really the western end of the table… but it makes more sense to say they were coming from the East…). 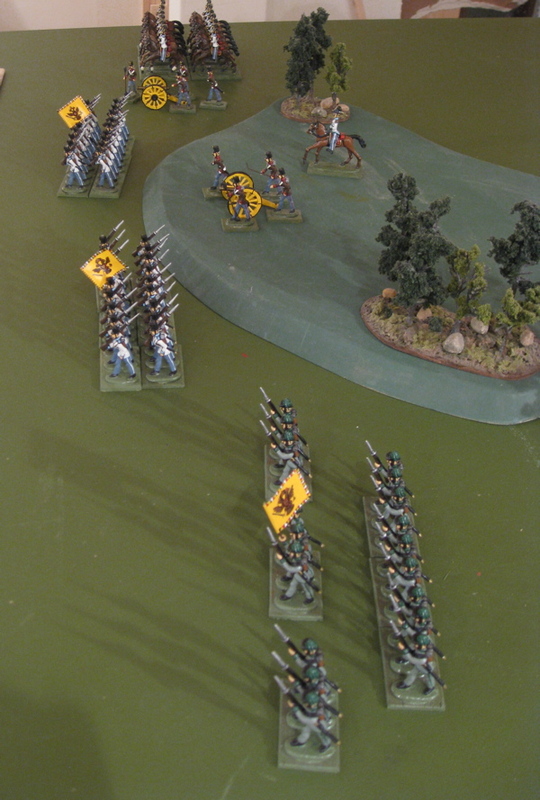 The Austrians has to hold their ground for five turns before falling back and exiting as much of their force off the Western edge of the table. We didn’t really set up any clear “victory conditions”… we just set out the scenario above and started playing… to see how it turned out. The Austrian forces. My light infantry are in the foregroun, beyond them are the two regular infantry units and artillery batteries, and in the distance the Austiran Dragoons. 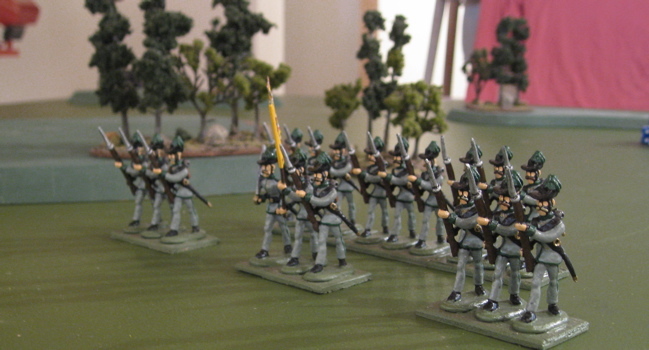 Another shot of the Light Infantry. These guys were true heroes of the day – they ended up causing grief to two Russian battalions without taking any casualties! The Russians forces preparing to advance. Ah, it’s going to be that sort of game is it…? Actually despite this initial appalling roll, the Austrians made a pretty good account of themselves! 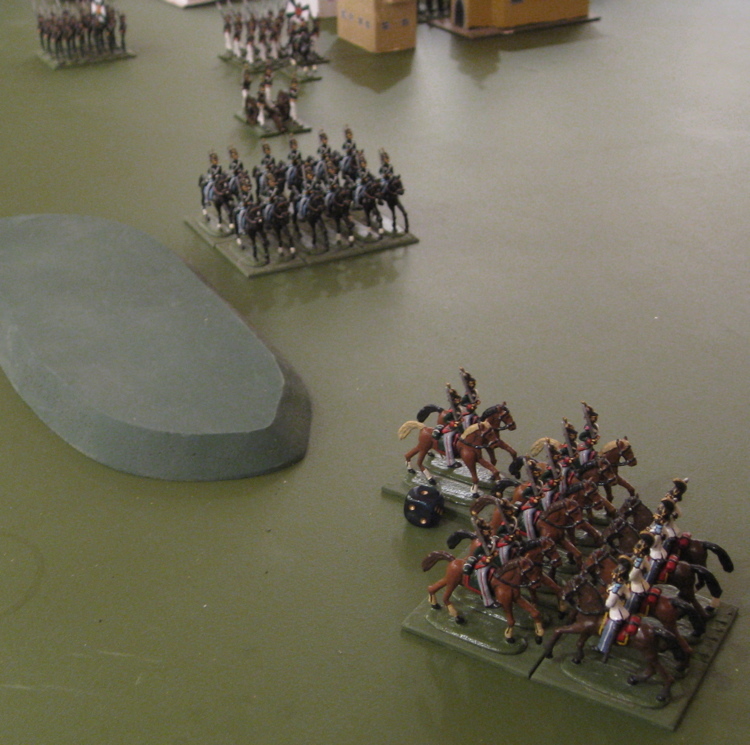 The other battery faired a little better – causing a casualty amongst the advancing Russian infantry. Russian on the advance. 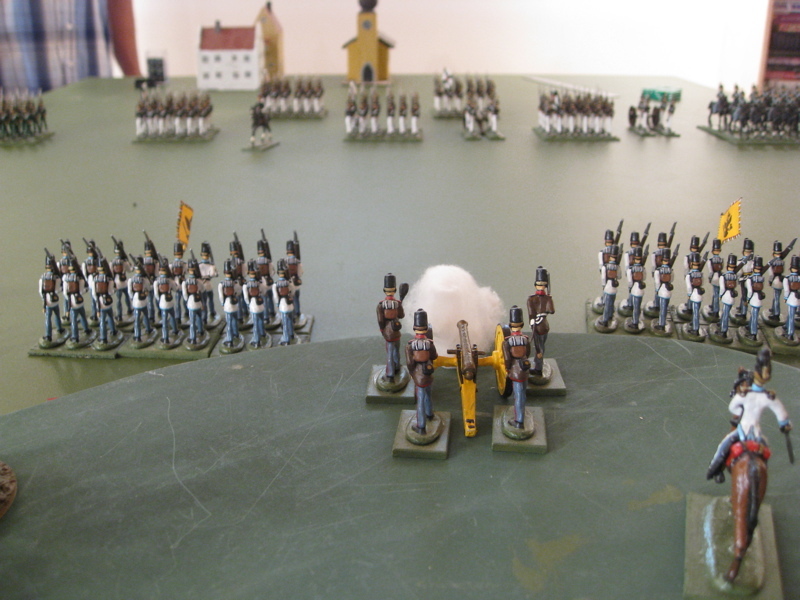 Austrian cannons firing away. 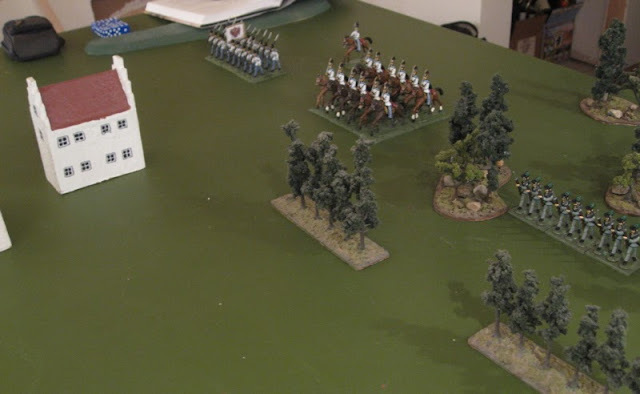 We drove them steadily backwards, nearly driving them off the far end of the table… after these lads wiped them out they turned around and galloped past the Russian guns and infantry to make it off the West end of the table with, I think, two of their stands remaining! The Austrians falling back across the big hill, Russian in hot pursuit!! With a bit of a traffic jam on the far side of the hill, one of the Austiran battalions turned to fire on the Russians again to give the guns and the other battalion time to get sorted out and off the table. In the end both of my regular infantry battalions made it off the table with about half their original number. The guns and my light infantry made it off unscathed (well… except for one gun team – they’d lost one crew man…) and, as mentioned before the Austrian dragoons made it off the table with two of their stands remaining! The Russians lost a lot of infantry, nearly twice the number of Austrians, and the Russian Dragoons were wiped out. I think they Russian could have done with some more cavalry (and guns?). We also could have made some impassable terrain (or at least bad going) that the Austrians would have had to funnel through to give the Russians a better chance to catch them. Once turn five rolled around I pretty much just had to walk away – the Russians going the same speed would never catch up, and not being able to move and shoot couldn’t even shoot my guys as they ran (as I would have quickly – within a turn – been out of range of their rifles)!? Still… good times! I’m definitely looking forward to playing again! Playing with these toy soldiers always gets me thinking I should start modeling some of my own!? DOH! ?